HERCULES was conceived in 2002 as a long-term R&D Programme, to develop new technologies for marine engines. To increase engine efficiency, thus reduce fuel consumption and CO2 emissions. To reduce gaseous & particulate emissions. The R&D Programme HERCULES is the outcome of a joint vision by the two major European engine manufacturer Groups MAN & Wärtsilä, which together hold 90% of the world's marine engine market. It was the first time that these two Groups participated together in a project with commonly defined Research Areas. 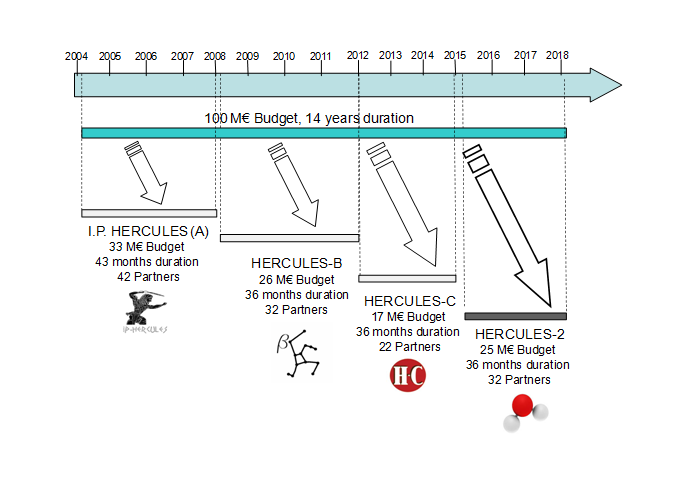 Three consecutive projects namely HERCULES - A, -B, -C spanned the years 2004-2014 with a combined budget of 80 M EUR and a total of more than 70 partners. More than 500 scientists and engineers worked in 155 subprojects on engine efficiency, fuel consumption, gaseous and particulate emissions and reliability. These three projects produced exceptional results and received worldwide acclaim. Already several research results of HERCULES -A, -B are offered as commercial products in new engines for ships. More than 30 patents are related to these past Projects. The HERCULES programme has shown that commercial competition between research partners does not preclude the sharing of R&D aims and the cooperation, in order to tackle issues of world significance, such as the environment. Phase I of the Programme HERCULES materialized as the FP6 Integrated Project "I.P. HERCULES" jointly funded by the E.U. and Swiss Government, as shown in the Figure below. The I.P. HERCULES (A) structure of work comprised 54 subprojects, grouped into 18 Tasks and 9 Workpackages, spanning almost the complete spectrum of marine engine technology. The duration of I.P. HERCULES (A) was 43 months, up to September 2007.The I.P. HERCULES (A) Consortium had 42 partners (participant organisations) with a total budget of 33M€. HERCULES- B was the Phase II of the original Programme concept. The project HERCULES-B run from September 2008 until December 2011 with 32 partners and 26 M€ budget partly funded with 15M€ by the E.U. within the Framework Programme for R&D FP7. The general targets for emissions and fuel consumption were retained in HERCULES-B. However, based on the developed know-how and results of I.P. HERCULES (A), it was possible to narrow down the search area, to focus on potential breakthrough research and to further develop the most promising techniques for reduction in specific fuel consumption (and CO2 emissions) and Ultra-low gaseous and particulate emissions. The technological themes of the HERCULES initiative have, since its inception in 2002, been higher efficiency, reduced emissions, and increased reliability for marine engines. However, for taking marine engine technology a step further towards improved sustainability in energy production and total energy economy, an extensive integration of the multitude of new technologies identified in Phase I and Phase II was required. The HERCULES-C project was the Phase III of the HERCULES programme and addressed this challenge by adopting a combinatory approach for engine thermal processes optimization, system integration, as well as engine reliability and lifetime. In this way, HERCULES-C aimed for marine engines that are able to produce cost-effectively, the required power for the propulsion of ships throughout their lifecycle, with responsible use of natural resources, and respect for the environment. The project had a budget of 17M€ and was funded with 9M€ by the E.U. within FP7. The HERCULES-2 is the next phase of the R&D programme HERCULES on large engine technologies. The project HERCULES-2 is targeting at a fuel flexible large marine engine, optimally adaptive to its operating environment. Of all ships worldwide, 99% are powered by diesel engines ranging from 1.000 kW to 85.000 kW. Engine design and development is a multi-disciplinary activity involving thermo-fluids, combustion, mechanics, materials, dynamics and control. The main issues in marine diesel engine design and operation have always been Reliability, Fuel economy and (since 2000) Emissions. With the ongoing R&D efforts, the issue of emissions will be mitigated in the coming years, with combinations of exhaust gas after-treatment, advanced combustion techniques, new fuels and control systems. Improved engine performance, operational optimisation, health monitoring and adaptive control over the lifetime of the powerplant, are further R&D issues to ensure lifelong reliability and economy.